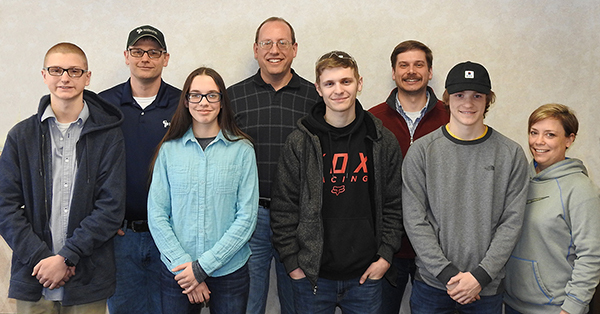 DuBois, Pa – Gasbarre is proud to have participated in a local job shadow program run through the DuBois Area High School to help the students identify possible interests for college studies or future employment. The students, ages 15-18 years old, were paired with Gasbarre professionals to see first hand what their jobs entail. Participating in the program this year were (from left to right): Dominic Hall and his father Joe Hall, Field Service Manager; Lauren Hoover and her father, Lawrence Hoover, Electrical Design Engineer; Noah Pierce and his mentor, Andy Skraba, Electro-Mechanical Engineer; and Jimmy DeFazio and his mother, Kori DeFazio, Production Assistant. Gasbarre is honored to play a part in the professional development of local youth. Gasbarre, headquartered in DuBois, PA, was founded in 1973 to design, manufacture, and service a complete line of powder compaction and sizing presses for the powder metallurgy industry. Since that time, Gasbarre has earned a worldwide reputation as a full service supplier to the powder metallurgy, particulate materials and thermal processing industries. With over 200 employees in North America, Asia and Europe, Gasbarre stands alone in the ability to offer equipment and services for all applications related to powder compaction and thermal processing.